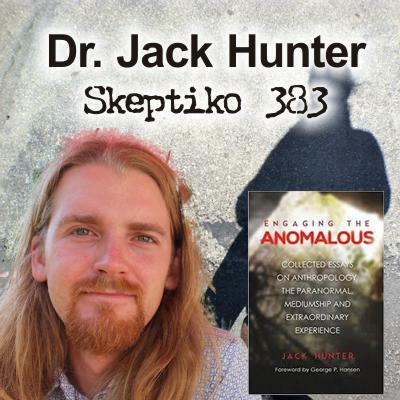 Dr. Jack Hunter has blazed a new trail called paranthropology, but that’s just the start of his paradigm busting. Jack Hunter: It’s kind of like murky territory. I know that Gordon [White of Rune Soup], for example doesn’t like the idea of panpsychism and he, like you, was talking about panpsychism is kind of like a backdoor materialism again, at the end of the day. Jack Hunter: It’s on the way towards animism but it’s not willing to go all the way. When we talk about panpsychism for example, we’re talking about some kind of, like a fundamental kind of consciousness, or a fundamental awareness that’s not consciousness as we understand it, it’s the basis of awareness. Whereas, when we’re coming from an animistic perspective, that other consciousness has just as much agency and intention in the world as we do, they just express themselves in different kinds of ways. So, the consciousness of a rock isn’t necessarily just some kind of, like a flatline background consciousness, but actually it possesses its own agency and intention in the same way that we do, but it expresses its agency and intention in the world in a very different way, perhaps over, like vast, vast timescales or things like that. Alex Tsakiris: This is fun because this is now an opportunity to take the conversation one step further because I’m listening to you and Gordon and all your cool thoughts on animism and I’m thinking, “But guys, you’ve missed the point. It’s on the way towards what?” Again, I mean, take these different wisdom traditions and I’ve always been interested in yoga and in the East and in particular Vedanta and non-dual kind of thinking. Hey man, all of those people, they’re saying, “Sure, spirits are here, spirits there, spirits everywhere.” On the way towards what? It’s about transcending that spiritual reality and getting to what’s next. So, it does seem to me to be somewhat of an arbitrary stopping point to say, “Ah, we’ve got it. We’ve arrived. It’s animism.” No, it’s like this discussion you were having about, does animism subsume idealism, “No, of course not, because idealism is really closer to that non-dual, vedantic kind of thing that says… it all goes into one. The wave and the ocean are separate only because we imagine them to be separate. What do you make of animism vs idealism? Does the "vs" make sense? Or are we talking about two different categories? IS PANPSYCHISM IRRECONCILABLE WITH IDEALISM? The well-known writer Bernardo Kastrup, an idealist, has repeatedly argued against the notion of panpsychism, even calling it a "threat." In this article, I will argue that Kastrup's interpretation of panpsychism is but one among many and that there are interpretations of panpsychism possible which do not contradict idealism in the least. One of these interpretations is my "hierarchical panpsychism of self-sustaining systems." Although I fully recognise that consciousness is ultimately unified and that the world, its objects and inhabitants are in non-dual consciousness rather than the other way around, I do not see why the line of sentience should be drawn at biology. As a biochemist, I will inter alia argue the versatile and complex nature of the behaviour of atoms and molecules at the individual level, their ability to respond to stimuli and their morphological fitness to harbour a reflective cybernetic feedback loop. Please note that I am not arguing that chairs and rocks are sentient; give me the benefit of doubt and do not condemn my theory prima facie based on the use of the heretic terminology "panpsychism." I am not presenting some kind of naive animism. Explore whether you can agree with me if an atom and/or a molecule could perhaps harbour a form of sentience. In the past philosophers defined panpsychism as the view that consciousness, mind or soul (psyche) is a universal and primordial feature of all things. A materialistic interpretation thereof is that matter either has consciousness or that consciousness is an intrinsic aspect of matter. In such an interpretation of panpsychism consciousness is fragmented, unlike the unified form it has in idealism. Moreover, this type of panpsychism would suggest that our human consciousness is merely the aggregation of all our atomic "consciousnesses." Rocks and chairs, by this definition, would also be sentient. The Physical World as a Virtual Reality by Brian Whitworth identifies many characteristics of the physical universe that seem to indicate the universe is a simulation. These characteristics include the big bang where space and time were created from nothing when the simulation was started. Quantum minima represent the smallest allowable values for computational purposes. The speed of light is limited because there is a maximum rate of processing. Non-local effects such as wave function collapse and entanglement can be explained if they are the result of calculations processed outside the simulation. Curvature of space by mass and time dilation from acceleration can be explained as processing load effects. The laws of conservation of mass, energy, charge, and spin result from the requirement of a stable simulation to conserve information. Simple mathematical natural laws, like gravity and electromagnetism, are a result of the algorithmic nature of the simulation. Quantum randomness can be simulated with a random number generator. All elementary particles are identical just as if they were defined by data structures in a computer program. The youtube video Digital Physics Argument for God's Existenceexplains that the best explanation for the simulator is that it is a mind. Quantum phenomena show that a mind is required for matter to exist. But a mind does not require matter for its existence so only mind can exist outside the simulation. The mind in which our universe exists would be God by definition. The video also points out that like a computer simulation, quantum mechanics indicates that the parts of the universe that are observed are the only parts that are actually instantiated. Palamite Panentheism is explained in the video Christianity and Panentheism on youtube. This philosophy is a form of monism or idealism that holds that consciousness is fundamental. Thanks for that interview - hopefully we have returned to what I would call mainstream Skeptiko podcasts! In answer to that question, my view is that the jump to Idealism is far too great - even though it may be the underlying ontology - and we all need staging posts. One intermediate point is Dualism, and another may well be Animism. As Alex said at the end of the podcast, even if you choose Idealism, you still need to flesh it out with some structure to get any further. Once again I don't know enough about these labels to offer anything, but still I really liked this interview and am very compelled by permaculture for many years now and find many inspirational voices and ideas in this community and now another one with Dr. Jack, thanks Alex! Still his "One School, One Planet" -- YIKES! Does this not scream of One World/New World Order Disney social programming? Academia is rife in it and I fear in his youth and exuberance he might have swallowed too much Kool-Aid. No matter in the short term, hopefully he will soon comprehend how important words and slogans are in this modern day war on consciousness. I do think permaculture is a big part of the solution and I'm so glad he was able to transmit that to you Alex! Maybe the solution is "One School, One Planet", I don't have a crystal ball, but I doubt it, and those with the resources in the places it matters will ultimately be thrown back by that verbiage, in these parts of the south they smack socialism and folks are all up to their eyeballs in that propaganda. Idealism (aka cosmopsychism), as I understand it, is the notion that all of reality originates in consciousness. There is no duality between matter and consciousness; matter is just the perceived appearance of "thoughts" or "processes" occurring in the one universal mind (or TWE -- That Which Experiences). Why is there perception, and what is it that perceives? According to Bernardo Kastrup, there's an analogy with how an individual with dissociative identity disorder (DID), can have apparently different personalities (alters). Each of these personalities is largely independent (not completely - the individual may to some extent know of his/her various personalities). "Dissociation" enables TWE to experience itself, but only in limited ways, as if from a separate perspective. Maybe some "paranormal" activity would be analogous to a certain amount of awareness between alters -- as there is in DID. This would bypass ordinary perception-dependent communication between alters or even, conceivably, between alters and TWE. In Idealism, many processes aren't deemed to represent "aliveness", but can still be perceived: these include on the gross scale planets and stars, on the medium scale rocks and soil, etc., and on a smaller scale molecules, atoms and subatomic particles. These constitute the perception that there is "matter" that is not alive, because there is no process underlying the perception that is responsible for animating it. The bodies of living organisms aren't in and of themselves alive; they are actually just how animacy appears to to us. This animacy gives the appearance of comprising multitudinous combinations of inanimate objects, namely atoms and molecules, albeit in vastly more complex arrangements and engaging in vastly more complex interactions than are found without animacy. The thing that is really alive is the process underlying what appears to us to be an immensely complex, interacting collection of chemicals. Upon death, this underlying process ceases and the apparent body of the organism decays, producing simpler chemicals of the kind that are deemed, once again, as inanimate. IMO, the word "cease" doesn't quite reflect what happens. I think that the underlying process that gives rise to the appearance of life continues, albeit not any longer being expressed as animacy in the conventional sense of the word. I have reasons for thinking this but I'll leave them for another time. IMO, animism doesn't distinguish between animacy and inanimacy. Yes, all that exists originates in TWE, it has that correct, but not everything is animate. Hence it's a somewhat defective model. Put another way, it doesn't distinguish between the very complex processes that underlie life and the comparatively simple ones that don't. Both types of process can be perceived, and both are within the mind of TWE, but only living beings are affected by the complex processes of animation. Panpsychism, really, I see as a mixture of animism and materialism. Everything has its portion of consciousness, even subatomic particles, and somehow these are meant to lead to the emergence of higher forms of consciousness found in animate entities. But all the evidence points to top-down rather than bottom-up processes, I've recently been reading many articles by a third way evolutionist, Stephen L. Talbott, which are quite convincing on this point. Many of these can be found here, and a good intro to his thought is here. I suppose the point is that if you take Idealism seriously (and I do), you have to accept that the physical world is created out of consciousness, and yet there are loads of important categories into which physical things are broken - living/non-living, plasma/gas/liquid/solid, bosons/fermions etc. etc. All of these distinctions could in principle be blurred away by saying it is all consciousness - but you wouldn't get much science done! Therefore looking for distinctions such as physical vs spiritual (Dualism) isn't denying Idealism any more than recognising that matter comes in different phases with different properties is denying Idealism. If reality is ultimately Idealism, there is going to be a lot of structure to be discovered. Science, when you think about it, is the study of appearances (to perception) and how they seem to behave. There are many appearances, which we classify into categories which are both animate and inanimate. There's much useful that can be and has been learnt and applied by identifying, classifying and modelling/mathematising those appearances in dualistic and even materialistic terms. No one is denying that. However, at a certain point, and I believe we have already reached it (despite diehard defenders of the faith continuing to vigorously assert it's not the case), it's readily apparent that dualist/materialist approaches to science are failing us. Increasingly, we've become stuck in and hidebound by outmoded paradigms. These zombie paradigms can be found e.g. in physics, cosmology, biology, medicine, anthropology... the list is extensive. I believe that we need new paradigms based on an Idealist ontology, and until those are much more widely accepted, we won't make much significant progress. However, at a certain point, and I believe we have already reached it (despite diehard defenders of the faith continuing to vigorously assert it's not the case), it's readily apparent that dualist/materialist approaches to science are failing us. Obviously it is, but my point is that there may be many steps between where we are now, and Idealism. Materialists have run out of steps, but on a non-material level there may be all sorts of structures, entities, and concepts to be discovered and understood - including a variety of animistic entities. Remember that most science isn't couched in terms of fundamental physics, but in terms of chemical bonds, the bulk properties of materials, DNA, diffusion of water through soil, etc etc. Try translating that lot into fundamental physics terms - let alone Idealism and you can see the problem. Yes you could wave your arms in the air and say, "look it is all interacting fundamental particles! ', but nobody could make any calculations or predictions at that level. There is no reason I know of why we should assume that non-material realms are any less complicated. It is also worth remembering that high energy physics has for years believed that string theory is too beautiful to be false. Now it seems to be coming unstuck. While it is nice to think that ultimately Idealism explains everything, it might be that reality is a bit messier than that. I am a devotee of animism, so I haven't bothered with Idealism, but I kind of get a sense that Idealism is more intellectual and maybe even metaphysical where animism is a more operative way of engaging with the world. I thought Jack did a decent job of explaining it. But, like Jack, I don't think that animism is the last word here. To me its more a political expression - in the sense that it stands as a clear counterpoint to materialism. However we are inherently conditioned by a cultural agency that delivers materialism and liberalism as a kind of toxic impost on our natural consciousness, which, I believe, is natively animistic. There's a thing in psychology whereby children go through an 'animistic' phase, and this is considered mostly to be some kind of inexplicable throw back to a 'primitive' 'pre-rational' mentality that is 'corrected' by proper education and mental conditioning. That's why children's stories are full of talking ducks, toothbrushes and sponges. But I argue that our ancestors were naturally animistic. There was no mechanistic or materialistic option open to them.The human reality was full of spirits - agencies - persons. Retreat from animistic awareness has been an intellectual process that rendered the divine spiritually dull through theory and dogma. In fact we retain that native animism and it is everywhere present in our culture, at least in vestigial form, if we go looking with curiosity and an open mind. My concern about asserting that everything is consciousness is not that it untrue, but that it is unhelpful as a guide for living. Yes that takes us away from materialism, but not as a guide. Understanding that our reality is a community of agencies demands a relational awareness as opposed to an analytical one. And that then leads us to think about conduct and values. In New Zealand, for example, a river has been accorded the rights and dignities of personhood. It is an agent, not a thing, and hence, definitely not a resource whose passive objective attributes renders it ripe for exploitation. I became an animist not because I was in want of a 'belief system', but because when I came across the term it articulated my experiences in a nutshell. I had previously long believed that reality was an expression of fundamental consciousness, but it was not an idea that any real utility beyond satisfying an entirely intellectual need. For me animism is an idea that articulates a reality that is immanent. Idealism and other theories are comparatively transcendent. There is no doubt a better term for a deeper and more complex understanding, but at the moment I like energy that animism generates as an idea. We need to crawl before we can walk. In permaculture terms animism is what has to grow in the devastated psychic landscape before more enduring ideas can take root and flourish. Its a healing idea. While I like Jack's thinking on this theme I do not think he has attended sufficiently to the essential nature of animism as the native mentality of humanity. Understanding that animism is the most pervasive and most ancient of ways of knowing is one thing, but we are intoxicated by notions of evolution that have asserted that animism is something we should grow out of - and into rationalism (materialism). But what actually evolves is the way in which the essential precepts of animism are applied. The difference between the animist living in close proximity to the 'natural world' and the animist in a high tech culture is only how animistic awareness is engaged with at the differing levels of technological complexity, not animistic complexity. If you are familiar with Strieber's and Vallee's work you may already have a sense of what high tech animism is capable of. We need to constantly remind ourselves that what materialists think is highly sophisticated AI is really very crude and clunky animation - the machine replicates the animistic agency very badly. So back to Alex's question - we need to distinguish between what gives guidance for relational awareness compared to what generates utilitarian awareness (that includes intellectual). If we want to position ourselves in a relational sense to the underpinning consciousness then animism is a better approach than Idealism and its sundry ilk. My point is that saying that nature of reality is stuff or consciousness makes no difference, because what counts finally is not about what is, but how we relate - as Thou or It. The issue we have with how we behave in the world is not about its objective (scientific, intellectual) nature, or its usefulness or risk to us (economic and political) but how we relate to the world as a community of agencies. It is finally a moral question - one that is perfectly expressed in the Egyptian idea of Maat. Patrick J.Deneen's recent book, Why Liberalism Failed, is an outstanding exploration of precisely this question of relational versus utilitarian modes of perception and thought from the point of view of contemporary political, economic and philosophical thought. This is a proper domain for animism as well - precisely because its relational imperative touches evert aspect of human awareness. There are different ways of looking at the question. One way is from an intellectual point of view: What is the ultimate truth? But there is another way of looking at the question: What is the best system of beliefs for a person seeking spirituality? In that case the answer will depend on the person, their history and their inclinations. So I would say the best system of beliefs is not necessarily the one that is closest to the truth because ultimately we will learn the truth in the afterlife. The best system of spiritual beliefs is the one that helps you most to live a spiritual life according to spiritual values like love, kindness, forgiveness, tolerance, etc. For some people the best system might be idealism, for others it might be animism, for others it might be an organized religion etc. Well looking at that article, I felt a bit underwhelmed. I mean nowhere did he mention that the particles that make up atoms are identical, and this feature is built right into the wave function. This means that electrons (say) can't have arbitrary bits of awareness stuck onto them. Unfortunately this extends to atoms themselves, and indeed molecules. I don't really see what it means to say that any of these things are 'aware' of anything. My other gripe regarding panpsychism is that nobody seems to use it for anything other than trying to evade the hard problem of consciousness! The "vs" does not make sense and panpsychism is not necessarily the idea that the larger consciousness is an aggregate of smaller consciousnesses, I don't see where that is implied. Idealism is correct in that everything exists within a top-down information field/consciousness, but animism is correct in that each individuated form within that consciousness is a fractal subset of the whole that has been granted free agency. Everything is alive. Rocks are alive, thoughts are alive, planets and suns, atoms and viruses. The forms exist and overlap on every scale imaginable, if it makes it easier for you think of it all as information. Even rust oxidizing is a struggle of various forces no different than games of cellular dominance and expansion. Little wars playing out everywhere. The end of the story that we are being drawn towards is already written at the end of time: we return to source and deposit our experiences of separation, we embrace the others and shed the inherent pain of loneliness, and we all experience awe as our eyes are reopened to the fact that everything that we thought was an other was actually us all along - mirrors and mirrors of us - and we all are that top-down consciousness that made itself forget. Though the future is certain, the path there is ours for the choosing and that choosing happens on the individuated levels, not as a mandate from the top-down. The only mandate is that at the end of time we all return. We were given the apple, the knowledge of good and evil, in other words the power to choose. God didn't sacrifice his only son for our sins, god begat himself into individuated forms (the sons/suns/daughters) so that we CAN sin by relinquishing and distributing his own free will into the smaller whirlpools of consciousness and creating a veil of forgetting. This simulated material plane is held in a delicate balance to make choices/free will possible and it seems to be an incredible wonder of the universe despite how horrific the Earth can seem at times. I'd like to take a swipe at the liberalism jab as well, but I have other things to get to at the moment. How anyone can be "spiritual", but decry appeals to empathy is beyond me. Unless your beef is just with neo-liberalism and in that I'd agree, neo- anything seems to always be terrible for some reason. Perhaps DEVO were right. ... the particles that make up atoms are identical, and this feature is built right into the wave function. This means that electrons (say) can't have arbitrary bits of awareness stuck onto them. I don't understand what you mean. As far as I know the wave functions do not have terms for awareness. How can the wave function indicate whether or not anything has awareness stuck onto them? Insofar as every"thing" we can perceive is an aspect of TWE, one might claim that every"thing" is conscious, but is TWE is conscious in the same way that we are? What if TWE doesn't "think" like we do, isn't conscious in the same way? We are conscious that we are conscious; TWE, on the other hand, may not be. It may simply be a brute fact that exists and does what it does without, in and of itself, being meta-aware that it's doing it. We provide it with a means of self-reflection, although that doesn't necessarily make it, in and of itself, self-reflective. Self-reflection is inherently compartmentalised, very much restricted, arises in animate beings like us that have much less ability to make things happen; but still, we have this one ability that it doesn't: self-reflection. It can participate in the self-reflection of each one of us, and that casts a tiny amount of light on the nature of its own being. In total, the many of us that are conscious that we are conscious help increase its appreciation of itself as if from a separate perspective. We are the means whereby it can slate its "curiosity" (a self-reflective descriptor if ever there was one, but it's very difficult to express a non-self-reflective one) about itself. After all, because it is all there is, what else is there to be curious about? It's always been doing what it does; its animating processes result in feedback for it, or, self-reflectively put, are a means of satisfying its curiosity. It is necessary for us, and we are necessary for it -- it's like an ouroboros, a snake endlessly gripping its own tail. As regards free will, I see it as a necessary conjugate of self-reflection. Without free will, we couldn't be self-reflective; without self-reflection, we'd have no free will. We'd be philosophical zombies providing no possibility for TWE to glimpse itself as if from separate perspectives. Free will necessarily implies that, as you say, we must have the ability to make free choices, including unfortunate ones. Well of course a wave function doesn't depend on variables such as 'awareness' - yet they supposedly describe the entire nature of the entity they describe - so what possible meaning is there to panpsychism, which attributes proto-consciousness (if you like) to atoms and molecules? Remember I was responding to Michael Larkin's link. Do remember, that most of us want to extend the scientific process into the non-physical domain - not replace it with a modification of Christian doctrine presented as revealed fact! Most of us aren't even Christians - I gave up nearly 50 years ago, and I don't see myself re-joining any time soon! I've never been a Christian, I've never had a 'faith', I'm reverse engineering the model that has dogged me (and I have come to accept) into the language and archetypes of the other models. If anything I view this all with a systems analysis approach. To me it's more akin to a unified information field than a material and non-material plane. I've never been a Scientist and I certainly do NOT want the scientific delusions and statistical misdirections of science muddying up the non-physical with "good enough" answers that seem predictive, but are more akin to horse blinders, they reduce the total amount of information to a singular perspective. If bringing science to the non-physical is what we're doing here then I'm in the wrong club. Personally I think if you're motivated in that direction you might want to check yourself for an inability to hold uncertainty in your hands and truly deal with it. I would instead prefer a new way of modeling the non-physical where no statement can be declarative, every declaration has an assumed "what if..." as a prefix, and NO numerical "facts" or statistics would be permitted at all. Answers lie in how we've built our models with language, ideas, and metaphors, not in the statistical results of the experiments run in our collective dreamscape. Fine - it just sounded as if you were backing Christianity! I still believe that science could help to explore non-physical issues, but it is like any other tool, if you abuse it and its methods you will get junk. Well some numbers are very interesting - the percentage of people surviving cardiac arrest that get an NDE (between 10 and 20 percent) is a really interesting number. Again, I think numbers can be used or abused. Nevertheless, I can fully understand your sense of disillusionment with typical science right now. I would instead prefer a new way of modeling the non-physical where no statement can be declarative, every declaration has an assumed "what if..." as a prefix, and . . . Answers lie in how we've built our models with language, ideas, and metaphors, not in the statistical results of the experiments run in our collective dreamscape. I like this a lot. For me and my way of looking at things, I wouldn't want to limit this idea to modeling the non-physical. I would want it to apply to modeling just about anything. In the model I like to play around with, there's that which is known and there's that which is unknown. In this model, "that which is known" includes anything a person can experience like thoughts, feelings, ideas, fantasies, beliefs, speculations, perceptions, desires, etc. "That which is unknown" is whatever we don't know and can't even imagine or fantasize about. "That which is unknown" can't be speculated about, because once you start speculating, you are back in "that which is known." "That which is unknown" is well and truly unknown. In this model, ideas like animism, idealism, non-dualism, panpsychism aren't really what they say they are. They are pretenders to the throne of ultimate knowing. They are red herrings. They pretend to describe some ultimate knowledge of the nature of things, but in this model, the nature of things is unknowable to the point where nothing that we can imagine can live up to the task of describing ultimate reality. (I believe Jack Hunter mentions this point in the podcast.) In this model, the most charitable thing we could say about animism, panpsychism, etc, is that they themselves can be useful models or tools for a person to work with in their life. I like this model, because it leaves a lot of room for mystery. Materialists would interpret the border experience in a materialist fashion and non-materialists in a non-materialist fashion, and both perspectives can be accommodated by the model. Edit: Fixed spelling of throne.